This Website Is No Longer Active. : Welsh Assembly Government and Edwina Hart hide behind an "Illegal Injunction" to cover up Criminal Acts and Medical Negligence. Welsh Assembly Government and Edwina Hart hide behind an "Illegal Injunction" to cover up Criminal Acts and Medical Negligence. Below is a letter from Edwina Hart AM dated 28th of October 2008. The contents of the letter clearly state that as far is she and her officials are concerned "the local authority and other agencies involved have handled the matter properly and correct procedures have been followed." We all know this to be completely untrue and a fabrication.The evidence that I have previously released was already presented to Edwina Hart and other prominent Welsh Assembly Members. It is a long list. They have all allowed this crime to remain in place to cover up for "Medical Negligence." It is also worth noting that at the end Miss Hart warns Dr Dai Lloyd that anyone brave (or stupid) enough to publish the truth in this case and break this illegal injunction is likely to be sent to prison as this illegal injunction carries a "Penal Notice." That's how desperate they are to keep this hidden. As far as I am concerned so be it there are thousands behind me in possession of all the evidence to take my place. Throughout my time involved in fighting this case the courts and others have consistently stated that the reason for this injunction being in place is to protect the identity of the kidnapped child ( now aged 25 ). This as everyone can now see is untrue. Elected Representatives, The Police, Doctors and Public Servants have conspired, lied and misled the public and the courts to avoid them all having to face Custodial Sentences for their actions. 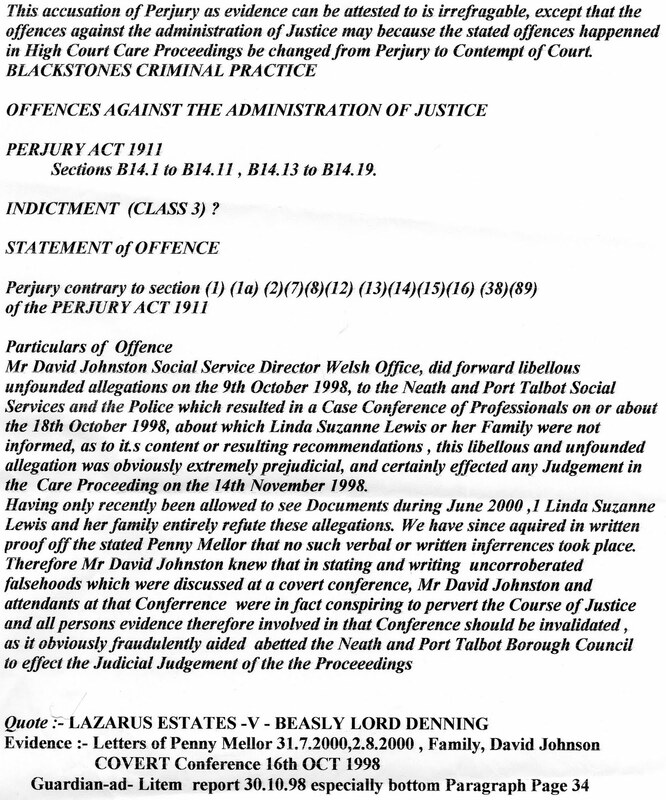 http://cllrkevinedwards.blogspot.com/2011/06/justice-for-linda-lewis-evidence.html I pointed out the following. Fabricated Letter from the Welsh Office written by Mr David Johnston a Social Services Inspector. A letter that was totally denied By Miss Penny Mellor see below. and was further denied in an email that Miss Mellor sent to me. 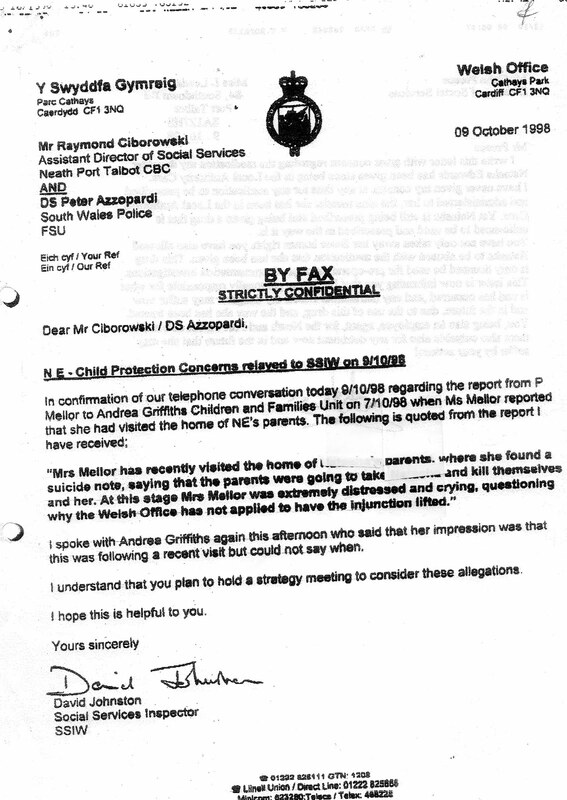 I did not, at any time submit any evidence to anyone that there "was a suicide pact" - this is a complete fabrication - given that I was helping the family and held in contempt of court for trying to help, why would I then jeopardise the work that had already been done. Sadly I do believe the family believe that I did this. I went to prison for my beliefs in another case, it does not make any sense at all for me to go to those lengths if I have done what is being alleged. Below is another damning insight into how Neath and Port Talbot Council and their representatives work. Information that has recently been brought to my attention. In the past members of the public and Councillors who have raised and questioned this case have been told by the Local Authority that if they had not removed the child the mother was going to kill her and herself. How despicable is that ? So "how the hell" can Edwina Hart and her fellow conspirators claim that nothing illegal has happened here ? Edwina Hart and other prominent Welsh Assembly Members, Judges, Lawyers,Brian Gibbons AM, Hywel Francis MP, Peter Hain MP and Social Services all received the following. Not one of them replied. They all buried it ! The above is from Blackstones Criminal Law Book. 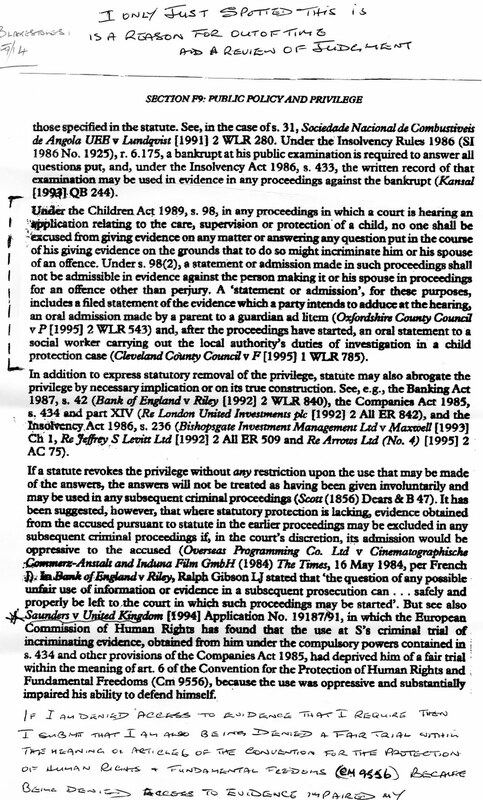 In the highlighted section above Children Act 1989,s.98 it states that " no one shall be excused from giving evidence on any matter or answering any question put on the grounds that to do so might incriminate him or his spouse of an offence." So how come that Mr Colin Preece former Head of Neath Port Talbot Social Services who had been "Subpoenaed " to attend court in Cardiff on the 3rd and 5th of June 2009 was conveniently allowed to leave the country on these dates on a " Getaway Cruise ? " Was Councillor Del Morgan the leader of Plaid Cymru on Neath Port Talbot Council who had previously stated "I would hope that council officers would inform all members urgently as to exactly what's happened and give councillors the explanation so that they can understand the background to this." who was also "Subpoenaed " did not turn up got at ? On the other side and just as serious the above law states that all witnesses either for or against have to be allowed to be heard in court. So how come Councillors Andrew Tutton, John Tallamy, Keith Davies and Frank Little who are democratically elected members of Neath Port Talbot Council as well as myself were denied the chance to testify on Linda's behalf by the corrupt Judge Seys Llewellyn ? We have further documentation proving Linda has deliberately been denied vital evidence and that witnesses who desperately wanted to testify on her behalf have been refused that right. Therefore the above law makes every action, court case etc that has attempted to falsely accuse and incriminate Linda in the past should now be declared illegal. There is, never has been, or never will be an injunction on this case that is legal. 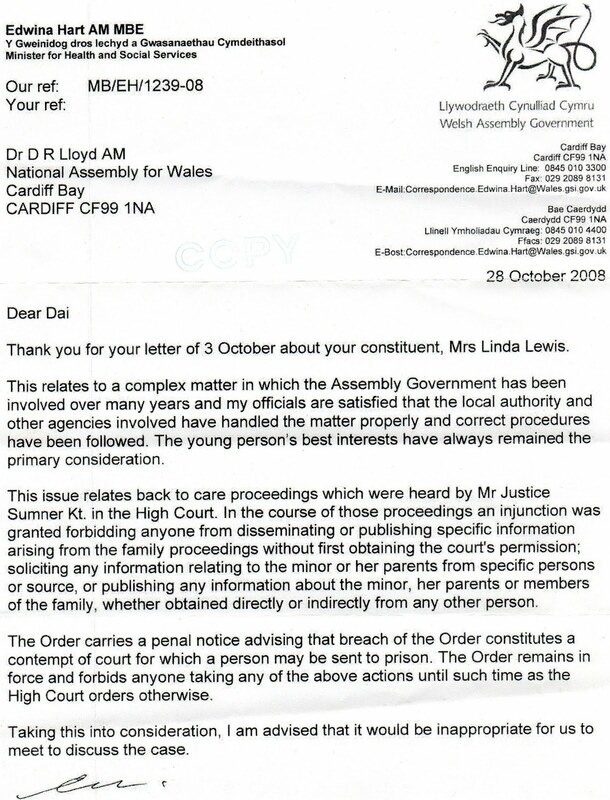 Edwina Hart's letter was a cop out - any material from children's act proceedings can be shown to an MP/AM and discussed in the assembly [parliamentary privilege]. Court orders do not overturn statute ie the rule of parliament or can they now?. This is typical of the type of person elected. Any excuse not to do anything. Why did dai lloyd not pursue it, or did he? he had parliamentary privilege. Jane Hutt as Minister for Children was just as bad when dealing with failures identified in Swansea before a death exposed those failures. Both are typical of many of our politicians in wales - side with the state at all times - soviets jane and edwina? now happy to make the cuts to protect the state. Interesting that it was J Sumner who made the order - a judge well known apparently to victims of UK family injustice. The Government victims Commmissioner today calls for law to guarantee the rights of famillies of crime victims . Louise Casey accuses Britian of having a two-tier legal system.while She says the rich can hide behind injunctions,hope this can be of some help good luck keep fighting. Thank you Kevin for having the courage to speak out. Love the way that Edwina Hart subtly tells/threatens Dai Lloyd to " F**k Off " and keep out of it at the end of her letter. She really is a piece of work and so are the rest of them. Looks like a massive cover-up all hiding behind injunction.People who speak out are threatned with Prison. they thought they had this case well covered so if people go to prison for speaking the truth,then there is something seriously wrong in our country. Law of bedlam comes to mind. she should be kicked out of the Assembly. There is now the question - in how many other cases have such letters been written by Ministers brushing off concerns regarding children's services in Wales? How many other children and families [victims] are being hidden behind the iron curtain court orders? How can we find out - there is only the drip drip of certaain cases such as this one which seems to have a similar pattern to other cases that have come out - if each case is supposed to be different how is it they all follow the same script/pattern? Maybe an FoI request or some other means? If Edwina Hart was presented with the evidence then she knew the injunction was covering-up crime. So how can Edwina Hart justify by saying the authority and other's involved have handled the matter properly. how could they lie about the Mother going to Kill herself and her Child. The facts are black and white and have been presented by yourself and Linda in the Criminal Courts of Justice in London and the Judge just smiled, my opinion was, he was laughing! They will fall Kevin and i hope Dr Hywel Francis gets punished correctly since he supports the Alzheimers group he is a carer, how does this man sleeps at night is beyond me? There again Dr Rhoeman used to be my doctor i moved away from his surgery, funny how he signed the paperwork for the state kidnapping and he is in charge of surgery mmmmm not hard to work out my friend. Justice 4 Linda Lewis will get my support until everyone concerned gets their jail sentence! I can only say as a friend of Linda and her family, they have been through hell for the past 13 years,they are a loving caring family who would not harm anyone. The evidence proves the family has done nothing wrong,Linda daughter was in the wrong place at the wrong time NEATH HOSPITAL this is where the COVER-UP started. I hope this will be over soon as they don't deserve to suffer anymore, lets hope some-one in Govenment will have the same Balls as you kevin and help the family. Todays Sun Newspaper Prime Minister absolutely disgusted with phone hacking,and said we need an inquiry, what about this case having an inquiry. Something Urgently needs to be done to help this family. As a parent you want to protect your children. "we had to follow orders or face the consequences". Isn't that what Edwina Hart is telling Dai Lloyd? There is only one conclusion to this. It now has to be over for the family. God Bless them for not letting go. It certainly is for the conspirators who instigated all this. I compliment you on helping the family. Conspiracy this is cruelty at it's worse. You have the freedom of speech in this country so don't forget it! When the government tells you when you can say it and approves what you wrote you can go on with the show. I know as an Aberavon resident that our useless MP has done nothing on this case. One of the criteria laid down by John Morris was that his successor would be prepared to cover up for him and his illegal actions. Toady Hywel Francis fitted the bill best of all. Toady Hywel Francis was the thickest. Toady Hywel Francis although a poor choice and a sad and shallow offering compared to his father Dai was chosen. As a former executive member of Aberavon Labour Party I know that we were putting a "Muppet" in as an MP. I was right his majority is down by 60% since he became elected. This is purely my advice. May I suggest that you all make appointments to see him at his next surgery and do not leave until satisfactory answers and pledges are forthcoming. This is his telephone number Tel: 01639 897660 to make an appointment through one of his staff. I support this campaign and I wish you well. I have met Linda and her family.I know that they would never cause harm to a living soul. I will stay anonomous for now but when you break this Councillor Edwards as I am sure that you will I will come forward. Natasha may well have been used in illegal research (relating to alleged MMR damage she met the criteria) that was being conducted at the Royal Free by Simon Murch, Walker Smith and Andrew Wakefield .... You need to look harder. If the comments are to believed that he has done nothing about this case he no different to those nazis who pretended not to know, closed their eyes and ears to the cries for help. We know who will be on the side of the jackboots. This is an untold story of more recent times and here in Neath not in Nazi Germany. Has David Johnston been arrested yet. Don't know where he is he is working in Ipswich and we are monitoring what he is doing. We go from strength to strength worldwide.